Muay Thai promotion “Thai Fight” celebrated its tenth anniversary on March 30 with the event held at CentralPlaza Nakhon Si Thammarat. Famed Saenchai battled it out in the main event facing Javad Bigdeli of Iran. The scheduled for three rounds catchweight bout (66 kg) ended before the final bell. Although the Iranian competitor appeared tricky and tough, it was all over in Round 2. Half way through the second round Saenchai tagged Bigdeli with left knee to the body. The latter literally asked for more. The Thai fighter delivered. Landing another couple of solid left knees to the body Saenchai proceeded with left elbow to the head, working levels. While his opponent was on the way to the canvas he followed it up with right knee completing the task. 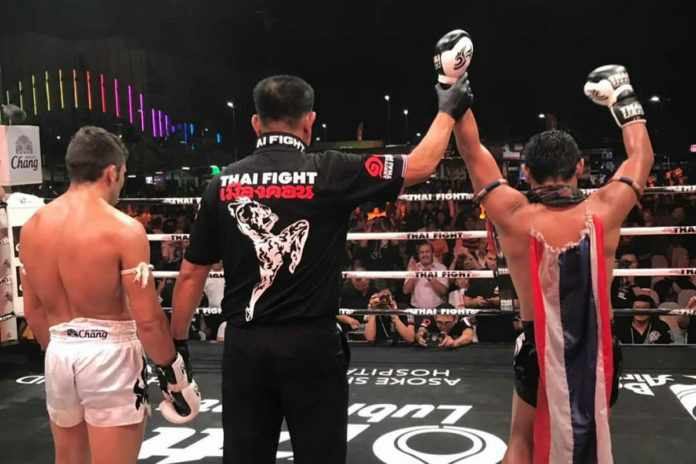 Although Saenchai’s “trademark” – cartwheel kick – was not executed this time he traditionally put on a spectacular performance, as well as updated his record to 308-49-2, ultimately riding the 45-win streak. In addition, it was his second appearance inside the square circle in one month following “Fight Night Dubai” held early March in the UAE where he scored a unanimous decision against Valerii Abramenko. Bigdeli dropped to 23-13. The rest of the card at Thai Fight Nakhon Si Thammarat featured a series of matchups in Kard Chuek where instead of boxing gloves the rope is used around hand and forearm. The complete results can be found below.